If you are in school you have to learn vocabulary all the time. First in your native language and later on in other languages. A vocabulary trainer aids the pupil in learning those words. A simply vocabulary trainer is VocabOne by Zeniko Software, It does not come with fancy tests, animated characters and other stuff that looks great but does not provide any value other than that. It's a basic trainer that displays a word and requests the answer to be typed into the answer box. The next page will display the answer of the vocabulary trainer and your answer so that it is easy to compare the result. Statistics can be enabled that display how many words have been correctly answered so far. One option that is well done is to flip languages on the fly. Instead of translating Latin to German it is also possible to translate German to Latin. The author provides three vocabulary sets on his website, German-Esperanto, German-Dutch and German-Latin. The format of the files is relatively straightforward and it should not take long to create your own data sets. The format of the vocabulary sets is always the same, it begins with the name in the first line (#Name) and lists all words and their translations in the other lines. The word(s) and their translations are separated by a "_" sign. The line for the English word car and the German translation Auto would look like this: car_auto. If several words have the same meaning they can be added with the ";"character. car;automobile_auto;automobile. 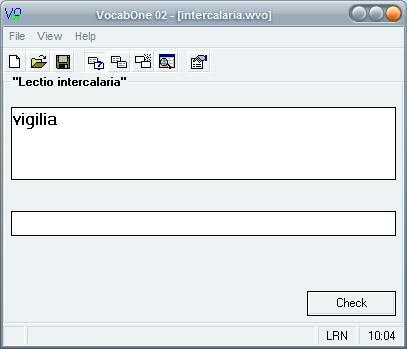 The main problem that most users will face is that VocabOne does not provide enough vocabulary sets which means that they have to be created before the user can use the vocabulary trainer. Although I have to admit, I find the webpage even better. If you haven’t checked it out yet, you should! Must be the best place to learn vocabulary I’ve ever encountered. I’ve been reading a thread ‘What’s a good memorization software?” on Donationcoder Forums, and thought it might be worth posting the link here. The thread mentions two highly recommended paid software (not too expensive I believe) and a few decent alternative freeware. I’m about to start exams in a month or two, so I think I’m definitely going to be using one of these softwares to help with my learning! I have found that “wordlearn 2000” unicode version is the best flash cards sw. It is a paid sw but it seems to have disappeared from the market.